McAuliffe: Virginia ends at the river - it's a Maryland bridge. McAuliffe: We now have 90 miles of high-capacity express lanes....we're also adding cars to VRE - we're adding capacity. On to Metro and Ray LaHood's report. The report from Ray LaHood is expected to be released next Tuesday. McAuliffe said that he'll put dedicated funding for Metro in his budget. If the existing board doesn't step down - the system is going to dramatically cut service. That's what Paul Wiedefeld is predicting.....suggests its urgent. "This thing is vital" to the region's economy. McAuliffe said that riders have fled Metro because of concerns over safety and reliability. We've talked about this far too long - Virginia is stepping up. On to Matt Lauer and sexual harassment and Roy Moore. Is there a double standard? Should Al Franken and John Conyers resign? He calls such behavior abhorrent - says Franken has apologized, we'll see what the ethics investigation decides. Supports the women - we need to have their backs - it is not easy. McAuliffe - He predicts more is coming - a new standard for any man today - no means no, you do not harass anyone. Julie: Should state employees go through anti-harassment training? 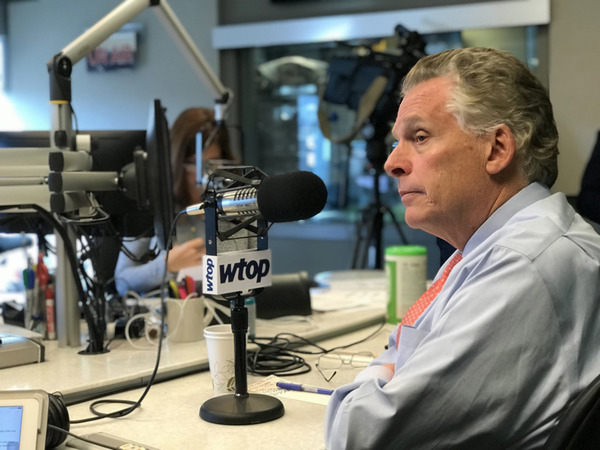 McAuliffe: It's a great idea, we should do that. Take the leadership in Virginia. Good to have refresher course to understand what is expected behavior in the workplace. Thanks again for your questions. We are sending them into the studio for the governor. Back to Metro and the board - Maryland might want another study to look at what the system really needs to survive....has this been a wasted exercise. McAuliffe: The report goes into "excruciating" details, pension benefits, bus line use - it goes into detail what need to do to make the system fiscally stable. We don't need any more studies. McAuliffe warns that if someone doesn't agree - DC or Maryland - service will be cut and it could be a death spiral for Metro if people stop riding. McAuliffe thinks that both Mayor Bowser and US Trans. Sec. Chao are "on board." Hogan's position is unclear. On to the federal budget. McAuliffe: What's happening on Capital Hill is very concerning. You have to pass a budget. In Virginia, we have to pass a balanced budget. McAuliffe - In Virginia, 1.5 million Virginians took advantage of the state and local tax dedication - adds up to billions of dollars. And more than 1 million took advantage of the mortgage deduction. That's it for this month. In December, he'll be here on a Friday. Shout out to Gov. Larry Hogan - he's always invited to join WTOP for "Ask the Governor." McAuliffe: Maybe he'll bring the Virginia crabs - remember every Maryland crab is born in Virginia. Thanks to everyone for joining us. We'll post the audio and a story shortly. Re: I-66 tolls, I didn't hear acknowledgment of the add'l 1.5 hours in the AM and PM where previously permitted solo drivers will now have to (a) pay to drive or (b) use neighborhood streets. For example, an early riser who presently takes I-66 E at 5:30am for free will now have to pay a toll on the way IN to work and again at 3pm on the way HOME from work. Doubtful they'll want to pay and will instead clog neighborhood roads and streets. Why has no one solved the Springfield to Dumfries mess. We need a metro more than anybody. I assume the private consortium building the toll lanes also profits from the tolls charged. Since the tolls change depending how much people are willing to pay and commuters won't pay much unless traffic in the general use lanes is so heavy that they become desperate isn't this a conflict of interest? The private company doesn't make money unless traffic is bad and people pay to get out of it. How is this and the price gouging model used for tolling in any way ethical? What is the governor's reaction to the GreenTech lawsuit? The opiod epidemic? Any thoughts on needle exchanges or allowing health departments to give clean supplies? Pharmacies are supposed to supply to residents with ID but still refuse to sell to people that need them. They even refuse actual diabetics at times. What about something similar to what Hogan passed in MD? Also decriminalization of marijuana? Is it going to happen? My husband is a disabled vet that now suffers from epilepsy and has tonic clonic seizures. Cannabis could be a treatment option but with the eilepsy treatment for cannabis it's hardly legal. The HOT lanes are nothing but another way to cater to the well off; the regular lane remain connected while those who can afford it sail through. Explain subcontracting highway construction to the extortionist company Express Lanes 495 who threaten lawsuits for innocent drivers who don't have ez-pass systems in their cars! I love politicians! Price gouging is OK if the private sector does it!!! I thought he was a democrat? Why do people have to pay tax on their vehicles year after year after year? Didn't we pay tax when we purchased the vehicle? Good morning Governor, Will you require VDOT to place "Slow Drivers Keep Right" sings along highways, especially on I-95 mainline and HOT lanes in NOVA? Would you support reducing small drug possession charges from felony to misdemeanor? why doesn't virginia have better support systems for mentally disabled people ages 20-30? Why isn't there any affordable housing in Northern VA and why is the Section 8 list wait 3-5 years long. I need to find a place for my son who is 22 and running into walls. Why doesn’t VA have a dedicated funding stream for metro? All the other states in the country do for their public transportation! That’s how metro Gorinson the mess they are in!!!! Thanks for the I66 Toll. We are loving it! Do away with the car tax. The 2 mile extension in Stafford has helped tremendously! Thank you!!! Good Governor we will miss you! Thanks for your service Governor McAuliffe!